In a handsome prewar building in Greenwich Village, a tenant struggled to remember the last time she turned off her air-conditioner. Upstairs, a young couple admitted to having let the window unit run for four days while they went out of town for a funeral, thinking it would be nice, amid the July heat wave, to return to a cool apartment. 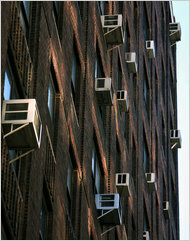 When utilities are covered, as in the building above, tenants do not seem to pay heed to effects like carbon emissions. Another resident of the 160-unit building, on Seventh Avenue between 13th and 14th Streets, says he leaves the air-conditioning on when he goes to work, when he sleeps at his girlfriend's apartment, even when he leaves the country on vacation - and only partly out of sympathy for his cat, Kitty. "My A.C. is pretty much running 24/7," Kitty's owner, Michael Perlo, a 28-year-old television producer, said with more bravado than guilt. "Not having to pay for electricity makes me a little bit more reckless." Forget round-the-clock doormen or views of Central Park. This sweltering summer, the most coveted New York real estate amenity is two little words that in other times can go unnoticed: "utilities included." Mr. Perlo and his neighbors live in a building where not just heat and hot water, but electricity, is part of their monthly rent - a more-common-than-you'd-think arrangement caused by old-fashioned wiring in which a building has a single "master meter" tracking power use rather than individual meters tied to each tenant. They can blast their air-conditioners all summer long without paying a dollar extra. Con Edison counts about 250,000 apartments across the city, not including public housing projects, that do not have individual meters tracking electricity consumption, compared with roughly 1.75 million that do. One large management company, Cooper Square, estimates that these units expend at least 30 percent more electricity year-round than their counterparts. So while lucky tenants across the city relax beneath arctic gusts, their landlords and building managers are left to worry whether these weeks of record-challenging heat will break the bank. And regardless of who pays the electric bills, there is a considerable environmental cost: a 2009 report said that residential buildings account for 39 percent of the city's greenhouse gas emissions, and 40 percent of the energy that buildings use is spent on heating and cooling. "Using it when you're not home is outright irresponsible and disrespectful of all the rest of us," Dan Hendrick of the New York League of Conservation Voters said. "There's no good way to look at this. The worst thing is, you're warming our climate to cool your apartment for your own comfort." But as any introductory economics course might explain, tenants who blast air-conditioners on their landlord's dime are making rational, predictable choices. "This is Homo economicus coming out in full feather," said Prof. Lawrence J. White of New York University's Leonard N. Stern School of Business. "When something is free, until some point of satiation, you will take up a lot of it." New York State's Energy and Research Development Authority, in part out of concern over the environmental effects of excessive air-conditioning, is planning to offer building owners financial incentives to install "submeters" that measure individual consumption, a major construction project that can require a significant upfront expense. Under an earlier incentive program, the state helped convert 426 buildings in the city over the last decade, said Jeffrey Gordon, a department spokesman. The new conversion project will focus on submeters, which track individual electricity use but still feed a single utility account paid by the building owner or manager. (Some landlords then charge tenants based on actual consumption.) That is simpler than individual metering and is seen as an improvement over master meters because it introduces a level of accountability, according to state energy officials. Con Edison estimates that there are 30,000 apartments in the city with submeters. David Kuperberg, the chief executive officer of Cooper Square, compared two co-op buildings he manages on the Upper East Side. Annually, the one with a master meter used 1.38 kilowatt hours per square foot more than the one with submeters, he said, costing an additional $52,000 a year. Over all, Cooper Square's 45 or so master-metered buildings have energy costs 14 to 24 percent higher than their submetered counterparts, Mr. Kuperberg said. But installing submeters almost always sets off a battle with tenants who are loath to give up what they see as a perk, even if it could lower their rent or maintenance charges. "Many of these properties have older populations, and some people are scaring them, saying that if you do this your costs are going to go up," Mr. Kuperberg said. "Nothing could be further from the truth." Indeed, some tenants in Mr. Perlo's building in the Village have become upset at a submeter plan in the works by the management company, Northbrook Partners. Mr. Perlo said that Northbrook had agreed to knock $150 off his monthly rent; but some residents fear their air-conditioning habits would surpass that. "It's the end of an era," lamented his neighbor, a telecommuter, who spoke on the condition of anonymity to avoid angering her landlord. "It was a great treat." Northbrook officials declined to discuss the matter. Two years ago, a similar kerfuffle unfolded at Stuyvesant Town and Peter Cooper Village, the famed middle-class enclaves overlooking the East River that had long offered "free" - at least to tenants - electricity. Tishman Speyer Properties, which bought the complexes in 2006, announced plans to install individual meters in each unit as part of an effort to reduce energy use by 20 percent. The news distressed some long-term residents, sparking newspaper articles and blog posts, including one that announced, "No More Free Electricity." Tishman Speyer abandoned the plans amid larger financial problems that ended with a default on the properties. Danielle, a social worker who asked that her last name not be used, definitely considered free air-conditioning among the "pros" for the two-bedroom apartment in Stuyvesant Town that she moved into last month. She and her roommate have kept their two units running almost constantly ever since, partly for her purse-size dog, who is in the house all day, but also for that moment, after trekking through the sweaty subways and steaming sidewalks of the city in summer, when they open the door and get to feel a chill. "I don't want to walk into a hot apartment at the end of the day," Danielle said, simply. "It's nice to not have to worry about it."